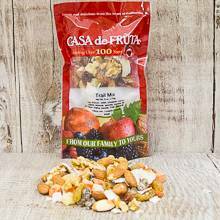 Customers have been raving about our trail mix ever since we began offering it nearly 20 years ago. Still mixed by hand, we start with almonds, then add walnuts, raisins, date nuggets, pineapple, papaya, apricot, and coconut. Packaged in a 6 oz. bag.